Here is Part III of Section IV. From the Chinese Masters from the Manual on Zen Buddhism written by the late, great brilliant scholar and Zen Master D. T. Suzuki. This teaching is so important! In essence, it explains the absolute necessity for living in the Present without the dualistic nature of thought or words and actually Being the Truth within the words. 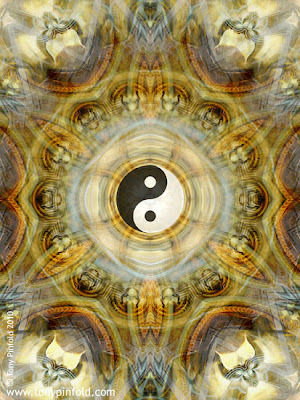 You must let go of All dogma and actually Live the Oneness of our True Nature which can not be described. Just live the meaning of the word "BE"! Everything happens for a reason and my writing this now and sharing these great words of Wisdom from an ancient Chan, or Zen, Master, are directly related to a conversation I had earlier tonight about this very aspect of Wisdom. All I can say is, "WOW"! This IS the True Nature of Reality and is realized in everyday life by those who understand the One Truth. I am constantly in Awe of the workings of this One Truth as it reveals IT's Presence and settles the waves of our illusory duality back to Reality's natural Stillness to reveal the explicit grandeur of the Calm and Peaceful Oneness within us All! With great honor and sincere humbleness, I offer you this impeccable Teaching. Enjoy! 25. [Self-] nature contains in it all objects; hence it is great. All objects without exception are of Self-nature. Seeing all human beings and non-human beings as they are, evil and good, evil things and good things, it abandons them not, nor is it contaminated with them; it is like the emptiness of space. So it is called great, that is, maha. The confused pronounce it with their mouths, the wise live it with their minds. Again, there are people confused [in mind]; they conceive this to be great when they have their minds emptied of thoughts--which is not right. The capacity of Mind is great; when there is no life accompanying it, it is small. Do not merely pronounce it with the mouth. Those who fail to discipline themselves to live this life, are not my disciples. 29. When people of inferior endowments hear this "abrupt" doctrine here discoursed on, they are like those plants naturally growing small on earth, which, being once soaked by a heavy rain, are all unable to raise themselves up and continue their growth. It is the same with people of inferior endowments. They are endowed with Prajna-wisdom as much as people of great intelligence; there is no distinction. Why is it then that they have no insight even when listening to the Truth? It is due to the heaviness of hindrance caused by false views and to the deep-rootedness of the passions. It is like an overcasting cloud screening the sun; unless it blows hard no rays of light are visible. Therefore, we know that Buddhas when not enlightened are no other than ordinary beings; when there is one thought of enlightenment, ordinary beings at once turn into Buddhas. Therefore, we know that all multitudinous objects are every one of them in one's own mind. Why not, from within one's own mind, at once reveal the original essence of Suchness? Says the Bodhisattvasila Sutra: "My original Self-nature is primarily pure; when my Mind is known and my Nature is seen into I naturally attain the path of Buddhahood." Says the Vimalakirti Sutra: "When you have an instant opening of view you return to your original Mind." 1. The Dunhuang copy, edited by D. T. Suzuki, 1934. Hui-neng = Daikan Enō; 637-712 A.D.
2. The text has "the Prajnaparamita Sutra" here. But I take it to mean Prajna itself instead of the sutra. 3. The text has the "body", while the Koshoji edition and the current one have "mind". 4. The title literally reads: "the true-false moving-quiet". "True" stands against "false" and "moving" against "quiet" and as long as there is an opposition of any kind, no true spiritual insight is possible. And this insight does not grow from a quietistic exercise of meditation. 5. That is, the Absolute refuses to divide itself into two: that which sees and that which is seen. 6. "Moving" means "dividing" or "limiting". When the absolute moves, a dualistic interpretation of it takes place, which is consciousness. 7. Chih, jnana in Sanskrit, is used in contradistinction to Prajna which is the highest form of knowledge, directly seeing into the Immovable or the Absolute. This are exactly what the one in the Non-Dual state of existence experience.The highest forms can only be experienced and lived in that state.But the Non-Dual state is not the final frontier as Shankara say there exists something beyond the Non-Dual. Thank you for sharing your Wisdom Neel. I was immediately impressed at the clarity by which this ancient Chan Master expressed this great Wisdom. Please come again and feel free to share in a more in depth manner. My cup is always empty. Be well!